What pair are you trading. For example; on the EURUSD 0.1 lot gives a value of €0.85 per pip. Also remember that the number you see in many quotes, for example the buy quote for the pair above at my broker is 1.18106. Now the move of price from 1.18106 to 1.18116 would be 1 pip move and a move from 1.18106 to 1.18107 would be one pipette move. This can sometimes confuse issues in calculations. See more in the lesson about calculating price in the lesson Babypips lesson on pips. I don’t know if this is the issue because I can’t see your calculation as you stated you are using a calculator, but I hope this might help. Hello Alanlim3. I have been trying out your PSAR scalping strategy and I must say it seems to work very well. I have a few questions. 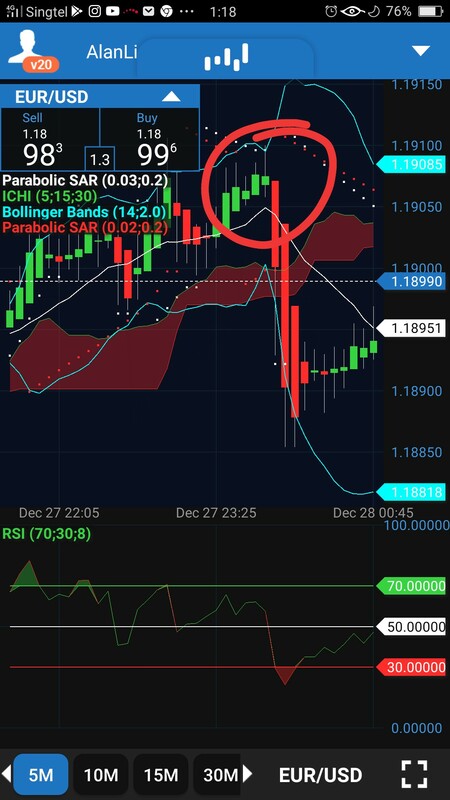 Do you wait for the candle to close after the candle has hit the PSAR, or do you take the trade immediately after it touches the PSAR? What are the other 2 indicators that are very useful? How many pips do you set for take profit and stop loss? But we don’t get lowest trading spreads from mostly reputed top brokers company, their trading spreads and minimum deposit always higher , that’s why beginners level can’t survive in there. Hi, I take trade immediately the candle touch the psar. There actually 3 more indecator I use. 1st. Is the candle. I don’t use orginal Japanese candle. I’m using heiken - ashi. It gv me a v clear view of the whole picture. If u study heiken candle u kn what I mean. 2nd. I use BB. Bb actually for my use is a guide line of the tread. If bb open too wide n price suddenly touch n over bb. 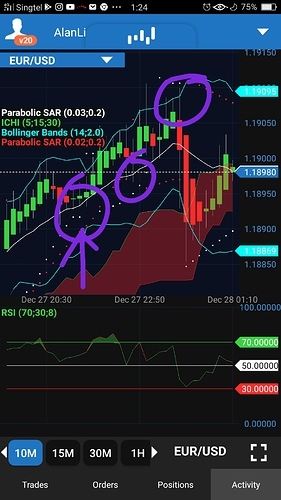 I may ignore psar n do a quick trade of maybe 5 pips or below. As long as there profit. Close the trade once there any profit regardless of how many pips. when you trade spot forex you’re trading against your “broker” who is actually your counterparty. If you could scalp profitably, they’d close you down very quickly, because they’d be the ones getting scalped. This is the main point to understand: against any other forex trader, a spot forex counterparty broker can lay off their net liabilities in the underlying market if they want to, but against a scalper, they obviously can’t, so it’s their own money on the line. You can’t do it profitably anyway as a retail trader, and there are loads of different reasons for that, but even if you could, you wouldn’t last long anyway, would you? They’re not going to let you win their money for ever! And the point is that (unlike their position with any other kind of trader) it really would be their money. Not the market’s money, and not their other customers’ money either. Not too hard to understand, really? Not hard to understand at all, and completely correct. The system Alan is kindly sharing here, however, obviously isn’t really “scalping” at all. What it is, though is “very interesting”. But I’m confused. The problem’s mine, Alan, not yours - I’ve managed to misunderstand what you’re saying, and your charts. So may I ask for clarification, please? When price touch the cloud that is the signal. Signal for u to start trading. Cos we don’t kn the price will go up or down. This part I think I understand completely, because the kumo is an area of indecision, and until the price emerges from it, it’s pretty hard to know whether to look for long or short entries. So you’re saying that you look for potential long entries when the price emerges above the kumo, and for potential short entries when it emerges below the cloud? That makes complete sense, of course, and is part of a standard way to use Ichimoku. Once the price is out of the cloud of it above the cloud only look for buy signal when price touch the psar. This part I don’t understand. If the price emerges above the kumo, and is rising, then surely the PSAR dots are going to be below the price candles? So how is the price going to touch the PSAR? 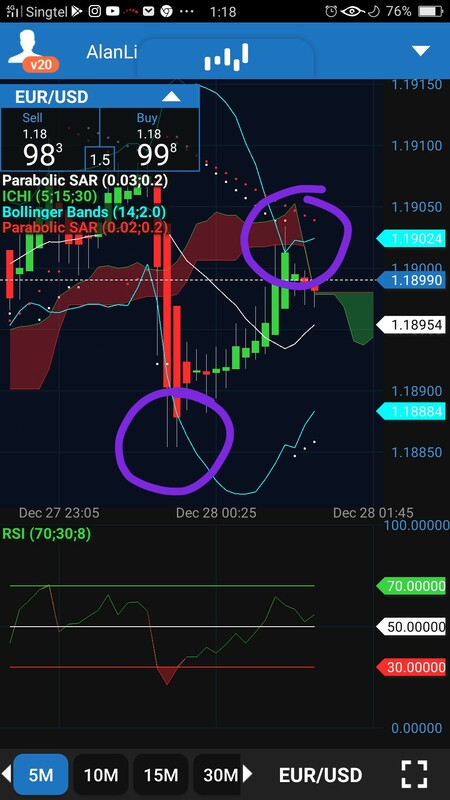 Or are you saying that you wait until the price-direction changes and the PSAR dots jump up above the price candles, to trade a reversal (i.e. to enter a short trade when the price is above the kumo, perhaps on some kind of “mean-reversion” principle)? Sorry if I’m being stupid, Alan - but I’ve obviously missed something fundamental, here. 1st. Candle above ichimoku n it keep going up. How we kn it going to pull back or reversed? The psar will b more n more nearer to the candle n with the help of bb. It open wide n candle pass over bb. From there can start to short it. When it going down u wining. 2nd. When u short. The candle is moving down, this where psar come in, n when it touch the psar u sell it. N reverse your trade into buy trade. This is how I do. Actually don hv to care the other high time frame cos. When we play low time frame. Ofcourse candle will up n down. So it don affect us at all. Hope u understand what I’m trying to say. Soory as my English is limited. Seriously change your chart to heiken candle chart n u will fully understand what I’m saying. N trust mi once u change to heiken chart u will glue to it. Cos it v amazing. I never found this kind of broker which is reputed top Fx company by the traders and always make sure best trading environment for beginners level. Another example m10. U observe the psar it will b side by side when price touch it. All those r trading opportunities. It’s a nice and practical example. Thanks so much Alan. You meant to say “sell signal”, right? I’ve already asked him, and he’s kindly answered (if you read just beyond the post from which you quoted! ). what else does one have to do? It would appear that scalping didn’t work for you because of the fact that you were trying to scalp certain moments which you should have sat on your hands. “Scalping” is by definition , “Buy the bid and sell the ask” - without DMA - It simply cannot be done ! Well that was 6 years ago. I’m a intraday trader. I find price pattern and structures to give me probability to take a trade. Scalping is not for me. I place one trade a day, win or lose. Well that is a start. So if you find patterns and structutes to trade then you would admit that you are ignore the driving force of the market which is price action correct? No I won’t admit that. Because I know price action is what drives the market. All I’m saying is that scalping doesn’t work for me. Shouldn’t take offense to what I’m saying.